Everyone has likely heard the term “Healthy Body, Healthy Mind”. This is also true for our loved ones with dementia. It’s imperative to support the body and the mind by choosing healthy foods and ensuring physical activity. Here are a few ways help keep your loved one’s mind and body healthy. You may remember the food pyramid from the 90’s. Well, like the fashions of the time, that pyramid is now out of style. It’s been replaced with a colorful circular plate illustrating portions from the groups: fruits, vegetables, grains, protein foods and dairy. By choosing a variety of healthy foods older adults will have a better sense of well being, more energy and will reduce the risk of developing chronic diseases. Below are the portions and types of food of people 70 and over should be eating. Learn more and see what your loved one’s plate should look like at www.ChooseMyPlate.gov. As our loved ones grow older, their calorie requirements also change. The metabolism slows and fewer calories are needed to support energy. For nutrition to best support the body, calories should come from healthy foods like vegetables, fruit, fish, nuts, reduced fat dairy, and whole grains. 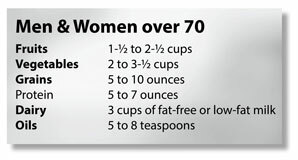 Below are the suggested calorie requirements for people over 70. Need ideas for healthy meals? Check out Assisted’s Cooking 4 Caregivers for easy ideas any caregiver can make. Choosing the right foods to eat can sometimes be only half the battle. What if you’ve chosen the correct food, but your loved one refuses to eat? Here are a few ideas to help encourage your loved one to partake in the meal. Set the scene with delicious aromas. Try baking some deliciously aromatic bread to go with dinner or cookies to enjoy after the meal. Is there a dish that they loved throughout their life? Choose a meal that they simply can’t pass up. When it’s time to eat, try to keep distractions and clutter on the table at a minimum. Physical Activity is important for all people, but can have a significant impact on those with dementia. It’s beneficial for both physical and mental health and can improve the quality of life for those suffering from all stages of the disease. Here are some tips to help keep your loved ones body healthy. As always, consult with a doctor before starting any exercise regimen. It’s recommended that patients in the early to middle stages of dementia spend 30 minutes doing a moderately strenuous activity at least five times a week. Walking is one of the best and easiest ways to get your loved one moving. Take a walk around the block. Count the mailboxes as you walk or talk about the different color cars you see. Dancing. Get your loved one moving by playing songs from their favorite era. They’ll be swaying and tapping their foot and reliving the memories of their youth. Gardening is a great way to be active while doing something enjoyable. Whether it’s planter in the windowsill or a garden producing their favorite vegetables, gardening is a great way of getting your loved ones heart pumping while soaking up vitamin D from the sun. These are just a few simple ways to get your loved one moving. Check out 7 Exercises for an Aging Body to for more simple low-impact exercises that can be done in the home. Patients suffering from late stages of dementia can use their surroundings for exercise. Things like sitting unsupported on the edge of the bed, walking short distances and standing while holding onto a chair are simple ways to help strengthen muscles.